Hi there, and welcome back to my blog. How are you? I hope that you are well. Today I’m going to talk about the hyperbaric oxygen chamber and the benefits that I’m getting from it. 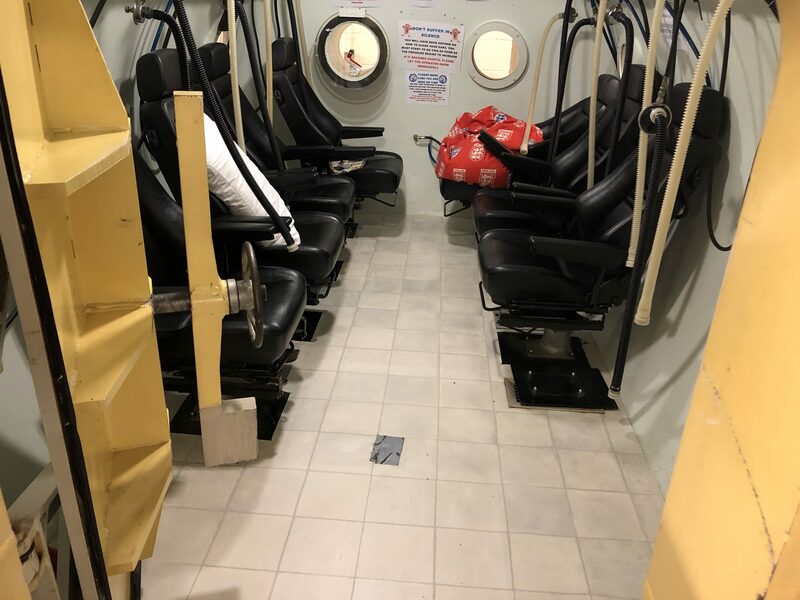 The hyperbaric oxygen chamber (HBO) feels and looks like a submarine. Here’s a picture of inside the chamber at Mercia MS Centre and below that is a picture of wearing the mask and headphones. It’s a giant metal container with seats in it. 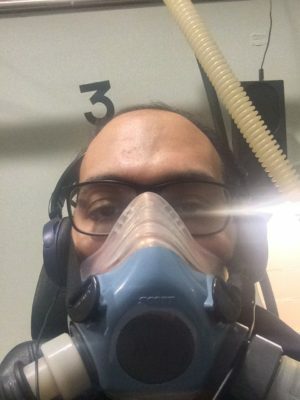 What you do is sit down in a chair, clear your ears while the pressure increases by swolling your saliva and when the pressure increases, you put on a breathing mask and breathe in pure oxygen for about an hour. The first session is a trial session and that lasts for 20 minutes. The idea is that you do an intense course of twenty sessions in five weeks and then either do one session a week or do another intensive course, twice a year. This is forever, but over the Christmas break, where the centre was closed, I rented out an Airenergy system. Airenergy is a box where you put filtered water in, stick a breathing tube in and the box makes oxygen from the water. You can do this either four times a day, for twenty minutes each time or do it twice a day, at forty minutes a session. Before the chamber, my eyesight had deteriorated to the point where I wasn’t comfortable driving. I would get headaches and dizzy spells when going on the computer. As I was a front end web developer before my diagnosis, this actually scared me. How am I going to go back to work? As I mentioned in my last blog post, I suffer from Diabetes Insipidus. Before the chamber, a good day would be me going to the bathroom ten times. As I mentioned in an earlier blog post, I play the ukulele and have poor handwriting. I’ve been practicing both of those for over 200 days now. I play a lot of brain training games. Before the chamber, my scores were low, especially with memory. So how am I doing now? Well I no longer get dizzy in front of the computer. I still get headaches, however, they are very mild. It’s allowed me to share my story with you. When I go for walks with my mum, I read out license plates to her. It’s at over twenty feet away. As I spoke to you in my last blog post, the number of times that I go to the bathroom has gone down dramatically. Before the chamber, on a good day, I would go to the bathroom 10-12 times. Now on a bad day, I would go to the bathroom six times. I’ve been playing the ukulele constantly for over 200 days now and it’s improved. Here is a recording of me, playing and singing “Somewhere Over The Rainbow”, before the chamber. And here’s a video of me playing and singing “Somewhere Over The Rainbow” and “Viva la Vida” at this recent February Brain Tumour Supports meeting. The same goes for my handwriting. I’ve been using Chinese baoding balls for over 200 days now. My right side of my body is weaker than my left side. I believe this is due to “my holiday” back in March 2016. Before the chamber, I would struggle with my right hand. Now my right hand is improving. I take Hydro Cortisone at 100mg in the morning, 50mg in the afternoon and 50mg in the evening. The chemist gave me a pill splitter for the 50mg dosage. Before the chamber, my mum did them for me, now I do it and my mum says that I do it better than her. With all of my brain training games, my scores have gone up, especially with memory. There are some side effects. I get headaches whenever I take a tablet, I’m hoping that in May, when I see the neurologist, that they can reduce the dosage. I’m also getting stomach pain whenever I take a Hydro Cortisone. Well that’s it. Once again, I just want to thank a few people. Firstly, I would like to thank my mum, dad, sister and my uncle, for being by my side, throughout everything. I would like to thank Louise from BTS for sharing this with the community. I would like to thank Kanika, Shirley and everyone at Carers Trust for giving me the confidence to sharing my story and I would like to thank Joe for motivating me to getting back on the horse. And I would like to thank everyone at the hospital, my family and friends and everyone who I’ve met on this journey. Please feel free to leave a comment. If you know anywhere that offer a hyperbaric oxygen chamber, you are more welcome to leave it in a comment. If there’s more than a couple of places, I’m tempted to create a interactive map for it. Please feel free to use my Amazon U.K. affiliate link. And if you buy something from Amazon, 100% of the money that I get, goes to Brain Tumour Support. Next time, I’m going to talk about scanxiety and how to handle it. This entry was posted in Brain tumour on April 1, 2018 by Arvin.